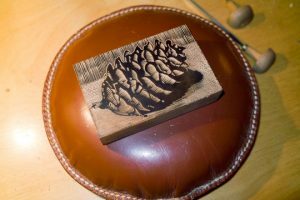 This wood engraving was to serve a dual purpose; to get back into making engravings and to create a Christmas card design. Unfortunately, life got in the way and I didn’t get it done in time for mailing although the sketch was ready and waiting. I’ll try again next year. 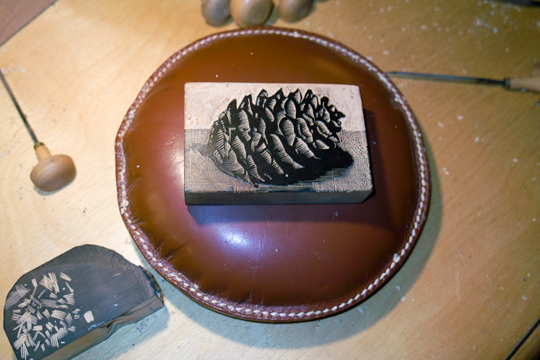 Ultimately it was a joy to get the gravers out and get down to making another wood engraving, no matter how simple. Just the satisfaction of parting the wood fibres was enough. 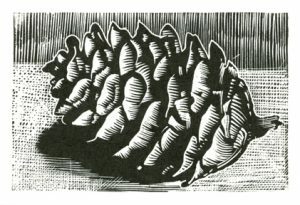 I used a large lozenge graver on the cone. 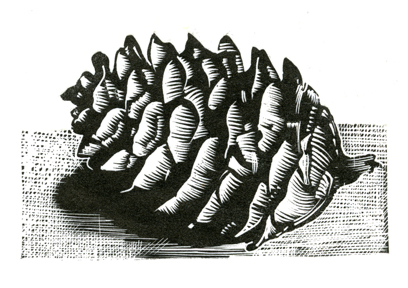 I’m very attracted to simple motifs like this spruce cone. To me it’s very haiku-like and contemplative. Even so, I was faced with making some editorial decisions. The rule of thumb when making a relief print, whether it’s a wood block or a linocut is to take care not to cut away too much before having pulled a proof. 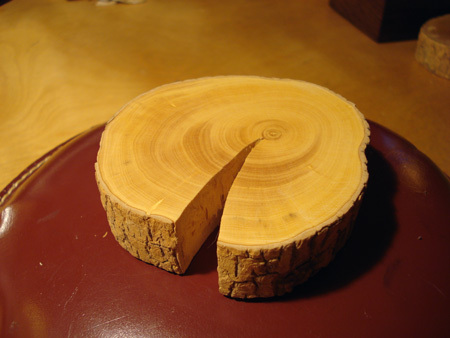 It’s much easier to cut away a little more than it is to add material that has been wasted. To that end I agonized over how much of the background to leave in the design. I toyed with the idea of suggesting the aurora borealis on the horizon but it seemed to take away from the cone. Here’s the first state of the print. It’s a tough call. Just the same I elected to remove the upper background and lower the horizon. Ultimately, I could have removed everything allowing the the cone to float in space. One of my hangups is the need for borders or something that defines the space, so this is a partial departure in that sense. I’ve always wondered about many Inuit printmakers who almost always float their design within a border-less space. I haven’t embraced that approach yet since I’m attached to well defined edges around the work. On the left you can see the completed block after tediously chiseling away material around the upper section. 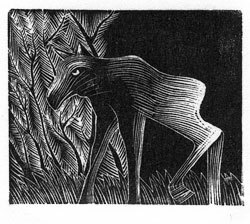 In any event, I’m quite excited and enthused about making some new wood engravings. Especially in light of the fact that any day now I will be taking possession of my new letterpress. Very exciting. John, it’s good to see you getting back to engraving with this beautiful image. I really appreciate your discussion of letting go of the background and having a frame versus floating the image. I may feel more free to try some different things myself. Your website was one of the first I found when I began wood engraving. Both your own work and the wonderful content on your website have been important influences and inspirations to me. I stand ready to pay up with a pint of Olympia’s finest ale if you ever get down this way. Neil, thanks for your encouraging words. The last few years have been pretty tough on my creative output so now I’m hoping to get things rolling again, hence my small print. Your engravings are very well done, good to see another engraver hard at work on his letterpress. My wife and I will be in Vancouver the week of Feb. 18th, although I’m not sure if I can make it down to Olympia. Would be nice tho. Great information & work! Thanks!